Transforming an existing medical research facility in Herston, QLD to align with the surrounding complex. 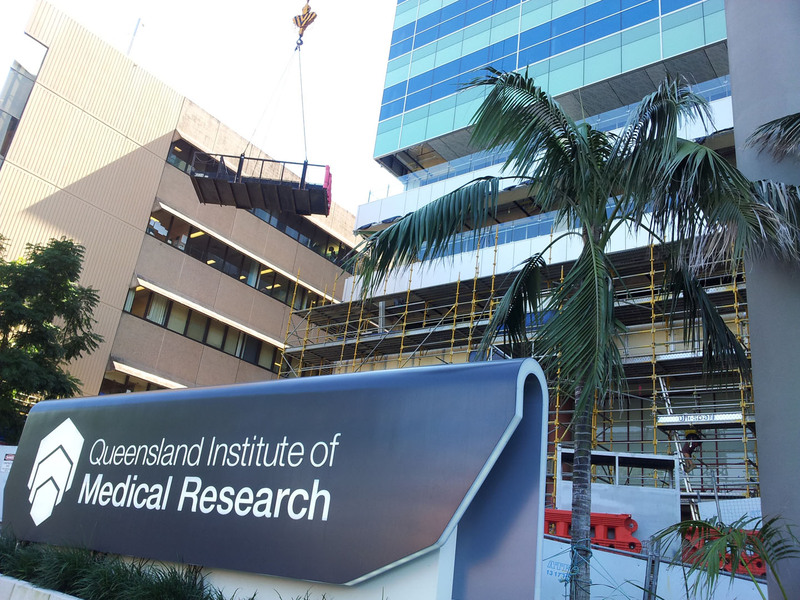 Queensland Institute of Medical Research Phase 3, or QIMR ph. 3, is the refurbishment of the Bancroft Centre. It is located just outside Brisbane’s CBD next to the Royal Brisbane Women’s Hospital. The Bancroft Centre, owned by QIMR is contracted to be built by Watpac. The project is designed by a joint architectural venture between Wilson and Wardle architects. This project initiated as a design and documentation contract, in which G.James were required to advise and recommend the design of glazing works, survey the existing building and detail the information via formal drawings. Due to the positive contributions and coordination of this aspect of the project, G.James were awarded stage 2 – the supply and install of the glazing works. The Bancroft Centre is a 14 storey concrete building with feature beams and columns criss crossing the building dividing up the individual windows and balconies spread across the elevations. At ground level, a large lobby window and sub station louvre is also part of the upgrade. The medical research undertaken at the centre is highly sensitive. In the pursuit of the solutions being investigated, the building will be partially occupied by the client throughout the construction process. This will affect parts or entire floors at different stages. Close coordination of on site works, monitoring clients requirements and ensuring safety for all, dictates progress. The basic concrete structure remains, with the southern concrete face being removed and extended out towards Herston Road. The extensions are supported by a grid work of steel with concrete platforms. The face lift is to extend down the western side to the existing balconies and on the eastern side to the recently erected QIMR central building. The main façade on the curtain wall is being replicated as much as possible. The visible rendered sheer walls are being covered with Alpolic cladding to wrap around to the front of the balconies and underside of the soffits in a similar fashion to the CBCRC building. Glazing in the balconies and lobby were replaced to reflect the more natural colour scheme and full height layout of the CBCRC. Louvres are being modernised and/or introduced to cope with the needs of the buildings updated research capacity, the design of which is in keeping with the other QIMR buildings. G.James has followed stringent processing and approval of the glazing samples and design to ensure these principles are followed adequately. Renovations on old buildings require them to be upgraded to meet the latest energy efficient guidelines. To accomplish this, the Bancroft refurbishment required higher performing windows than the original. Another important design element to consider was that the Bancroft Centre is situated at what is now one of Brisbane’s busiest intersections. Fronting onto Herston Road, a stones throw from Bowen Bridge Road, bus ways and the Inner City Bypass, shows the heightened necessity for acoustic protection. The main curtain wall façade utilises the 651 series with highly efficient IGU’s made from Solarplus engineered glass with an acoustic laminate internally to assist with noise deadening. The visible features of the curtain wall replicate that of its neighbour providing a plaid pattern of greens and silver that provide the desired sister building effect. The balconies use 450 framing with 475 door systems for the balconies’ hinged and sliding doors. A custom solution was introduced with laminated glass incorporating a thick 1.14mm acoustic laminate and energy tech inner lite working together for maximum efficiency and sound protection. An environmental advantage to being involved in the design of the cladding, minimised the wastage by designing the cladding widths to suit what was commercially available. Approximately 85% of the panels could be made to their natural width. The lobby or main entry spans a height of two stories. It has concrete features penetrating through the facade. This required some innovative design to incorporate these obstacles while maintaining the ability to replace the existing framing in a short turn around of a week. 650 framing was used in the lobby to achieve this. The curtain wall is usually lifted into place by a mini crane positioned on the building. It is dedicated to the curtain wall install. On QIMR however, a tower crane had been fitted on site to accommodate phase 2 construction, and is also being used for phase 3. This meant that fixing the curtain wall had to be timed in between other site deliveries and other uses required of the crane. The Bancroft Centre prior to works. The new southern face taking shape. Curtain wall, balcony glazing and cladding installed. This has been a unique project with G.James contributing very early in the design process to assist in setting our the buildings requirements for our own and adjacent works. The achievements so far have culminated with smooth progression though out the project with the mutual assistance and close coordination between Watpac and G.James. G.James role at the Bancroft Centre is to be finalised approximately mid 2013, and the entire project to be competed by mid 2014. Tours of the QIMR facilities are available to the public. You can book a tour on the QIMR website. The completed QIMR Central awaiting the unveiling of the Bancroft Centre. Façade panels in the warehouse ready to go. Wrapped up prior to commencement of the install. Lifting a façade panel into place. Curtain wall glazing nearly to the top. Curtain wall glazing has reached the top of the building. Glass is at its most vulnerable when the construction work is going on, and many hazards threaten. The top of the curtain wall needs to be finished with good drainage and water proof design. Balcony works underway – you can see the original glazing that was replaced. Inspecting the G.James balcony works – glazing, soffit and cladding. Nearing completion, the balconies are looking good. The top of the cladding sheer wall peaks over the neighbours from the street. The Lobby glazing is removed to reveal the blockwork behind. The East cladding folds around the new facade to join up with QIMR central. This entry was posted in Facades, Glass, Shopfronts and tagged 450 Series, 475 Series, 650 Series, 651 Series, acoustic performance, Brisbane, Curtain Walls, Design, energy efficiency, Glazing, Laminated glass, noise reduction, refurbishment, Renovation, Shopfronts, Sliding Door, Solarplus glass. Bookmark the permalink.